120 lbs. max. motor wt. The original Dillon Mini Tunnel was built in 2006 and was my first attempt at tunnel boat design. I had good luck with the Mini, but it was clear that there was room for improvement both in design and construction. In 2009 I incorporated those improvements into a new design which became the very successful Dillon Pro Tunnel. Since the introduction of the Pro Tunnel, sales of Mini Tunnel plans have dropped considerably. In the spring of 2011 I completed a rebuild of the original Mini Tunnel. The main goal was to deepen the tunnel up front, allowing it to gulp more air for more lift, and to raise its shovel-nosed bow a little higher off the water so that it was less likely to dive into a wave. The results were promising, and so it became my intension to completely redesign the Mini Tunnel. Now that has been done. The Redesinged Mini Tunnel is a few inches shorter than the original, has a deeper tunnel forward, and has the pickle-fork bow that one expects of a tunnel boat. I am suggesting this boat as a good choice for a younster (or other light-weight driver) using a smaller motor, say 15-20 hp. On the other hand, the Mini Tunnel should still be able to handle the 30/35 hp OMC motors used in GT Pro racing, though the Pro Tunnel is probably better suited for that purpose. The Redesigned Mini Tunnel may also be suitable for Junior Class racing in Australia, which uses 15 hp motors for their top Junior division. 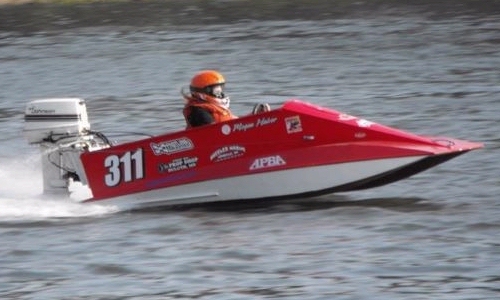 This boat should NOT be used with any motor exceeding 120 lbs. 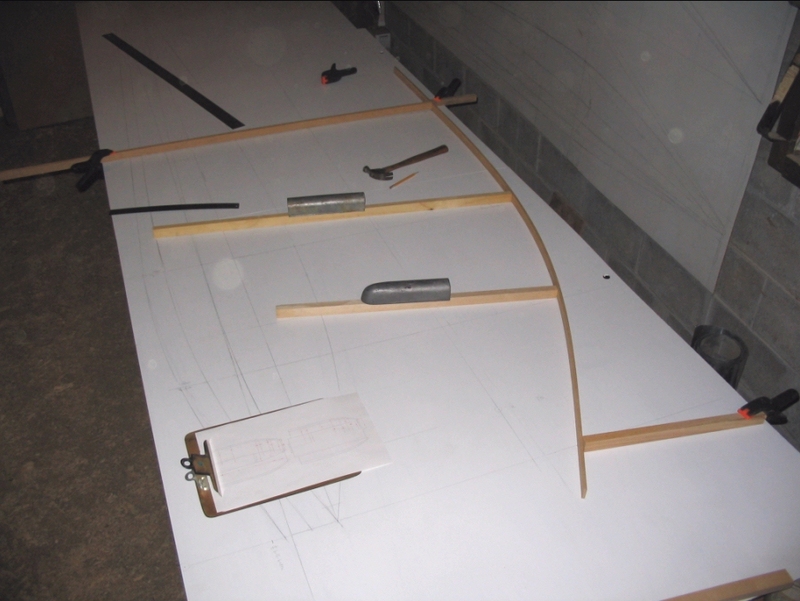 The plans package, available via direct download or by postal mail, includes twelve measured drawings; a scantling list; and some notes on wood, hardware and other materials needed to complete your boat and set it up for recreational boating or sanctioned racing. Also, I provide extensive online construction notes, including dozens of photos, which will guide you through the entire building process. And, I will be just an email away if you have questions. The plans package is $50 US via direct download; or $60 printed on 8.5" x 14" sheets and sent via postal mail. You can pay online through Paypal (you do not need a Paypal account), or you may send a check or money order. 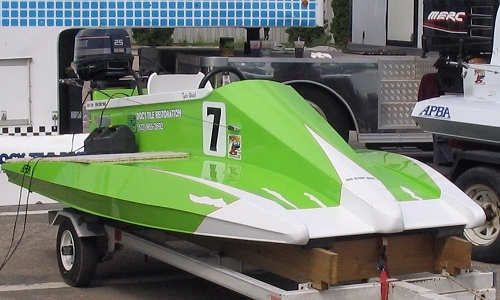 The redesigned Mini Tunnel has the full-bodied sponsons of the rebuilt original Mini (above), with the pickle-fork bow of the Mini built by Jeff Talcott (below). Dillon Mini tunnel vs. Dillon Mini Vee, Detroit Lakes, MN, June 2007.